Ceviche is a popular dish in Central and South America and is made by "cooking" fish or seafood by marinating it with lemon and/or lime juice. The citrus juice not only adds flavor to the fish, but the citric acid also denatures the proteins, thus "cooking" it. Ceviche kind of reminds me of sushi because the seafood still tastes raw, but with a great citrus flavor. I'm seeing ceviche served more and more in Mexican restaurants. I had some great ceviche at Agave in Naples (read my post) made out of a variety of seafood. However, the shrimp ceviche at Blue Agave in Chicago that I had a couple of weeks ago was not the best. The salsa was too sweet and the shrimp had actually been cooked before marinated, so it wasn't even really ceviche. This recipe uses scallops, which are one of my favorite seafoods! And they are served in the form of a salsa. I've also seen ceviche served plain on a chip, with the salsa on the side. I adapted this recipe from one that my boyfriend's dad, Jim, gave me! 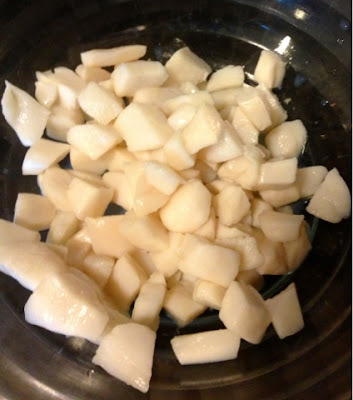 Chop the scallops into bite site pieces and place into a bowl with the lime juice. Marinate in the refrigerator until the scallops are opaque, about 3 hours. The picture above shows what they should look like after marinating (basically not pink). I marinated mine overnight because it was easier. Place the scallops in a large clean bowl and reserve the lime juice. Add the rest of the ingredients to the bowl and mix well. Add some of the lime juice, to taste. You should also wait to add the avocado until just before serving so it doesn't brown. (The picture below doesn't have the avocado yet). 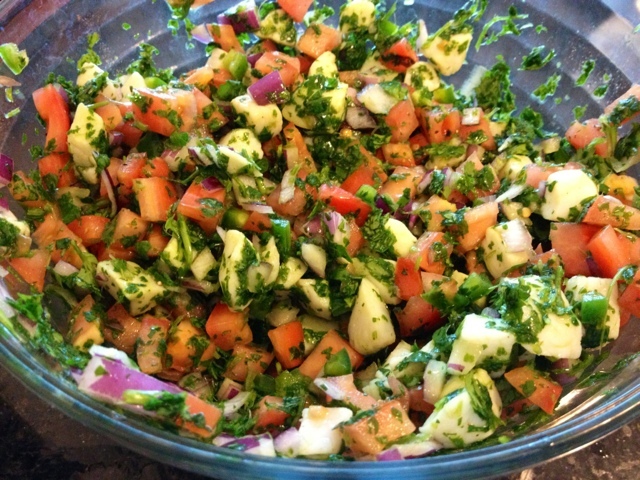 Serve this ceviche plain in martini glasses, as a salsa with tortilla chips, or inside of tacos. You can also save leftovers for a couple of days. Enjoy! What's your favorite scallop dish?